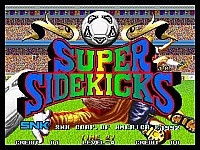 Super Sidekicks is one of the few football (or soccer for all the US people out there :) games I have ever taken the time to play in the arcade. I am not a big fan of football, so I don't usually bother. However, I found that this game was quite a lot of fun to play, especially against a friend. 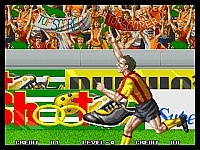 Being an arcade football game, it is not all that realistic. The main aim is for it to be simple enough so that you can just �pick up and play�, so the controls are very simple. When you have the ball pressing the A button will make your player shoot and the B button will make him pass. When you are defending, �A� makes you slide tackle and �B� makes you shoulder barge the nearest opposing player. That's just about all there is to it. Each match moves at reasonable pace and is fairly enjoyable to play. 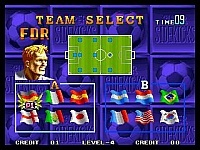 You get to pick from 12 international teams, each with different skills such as passing, shooting etc. One thing I noticed is that you never really seem to get penalized for fouling your opponents, only occasionally. This can be cool if you like to play football games in the same way you play fighting games� Vinnie Jones style! :) One thing that really annoys me is that you can't change control to the nearest player by yourself; the computer does it automatically. I really think it should have been assigned to the C button, which would have been much easier! The graphics are what you would expect really. They don't look fantastic, but I think that they are better than the graphics in Goal Goal Goal! There are some nice presentation screens for when you score goals, like your player running towards the crowd, or running up to be congratulated by the team's manager. The animation is not amazing either, but is passable for a 1992 game. Exactly the same thing applies to the sound. It consists of all the usual football game sound effects like the crowd cheering and also has some speech here and there. The music that you get while in the game is good in places as well, but could have been better in some others, where it is more than a little average. Super Sidekicks has aged considerably, although it is still fun to play even today. 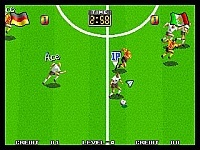 There are much better and more realistic football games around on other systems, but this is a good arcadey game to just put on for a quick kick-around every now and then, although it is far more fun in two-player mode... especially considering how good the CPU is at stealing the ball and generally being very cheap. The sequels to this and also Neo Geo Cup '98 have all surpassed this game however, so you may want to check those out instead for your Neo Geo football thrills, unless you want to play this for nostalgic value.